The report emphasizes on a set of principles aimed at regulating the modern medical fraternity in its provision of healthcare and research ("Principles of the Belmont Report," n.d.). The principles embedded within emphasize respect for the voluntary nature of participation in research, valid and informed consent and the need for the investigator to guarantee and ensure the welfare of the participants. The ethical principles as stipulated in the report are as follows. Ø Respect for persons- the principle has two considerations. First, the research participant is to be treated as an autonomous being. Second, the law requires protection of those incapable of making decisions such as children and the sick from coercion by others. Respect demands that participants enter a research program voluntary and well-informed concerning the research goals. Ø Beneficence- involves doing well to the individual. The principle requires doing no harm and increase the benefits while minimizing the possible damages. The principle obligates the society and the investigator. The community is needed to think about the long-term advantages and risks of the program while the researchers are required to plan for maximizing profits and minimizing risks. Ø Justice- the report outlines the benefits and harms to the participants of the research. The principle requires that the harms and benefits of the research be uniformly distributed. Constant monitoring of research participants is required to determine whether a systematic selection approach is adopted only due to availability or due to vulnerability or manipulation. Justice ensures that reasons pertaining to the research are used in the selection process. The above three principles regulate the application of comprehensive ethical principles in research that involves human participants. 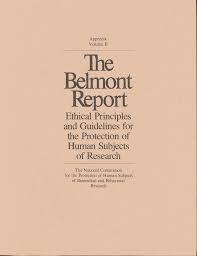 However, a critical ingredient in the respect for the rights of the members is the informed consent theory ("Belmont Report | HHS.gov," n.d.). The consent document stipulates in summation the information to be provided to the member.